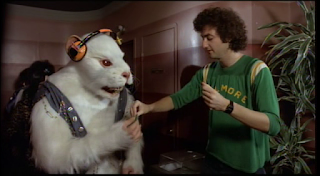 Legendary producer Roger Corman wanted to make a music-infused film that would appeal to the youth of the 1970s, and he enlisted his employees Allan Arkush and Joe Dante to come up with a story for such a project. Once that story was in place, Richard Whitley, Russ Dvonch, and Joseph McBride wrote the screenplay. Arkush would end up directing the film, which had a 21 day shooting schedule; rather lengthy for a Corman production. Even then, the effort of trying to get the movie done in that time caused Arkush to collapse for exhaustion, so Dante - who had just made Piranha the year before - had to step in and direct some scenes on the last day of filming. During the development, it wasn't clear just what sort of music the film would be focusing on. Earlier titles reflect the different possibilities: would the movie be called Disco High or Heavy Metal Kids? 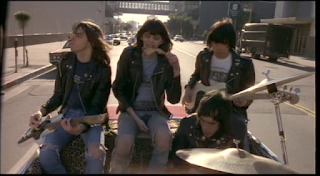 Todd Rundgren, Cheap Trick, Van Halen, and Tom Petty were among the musical acts considered to appear as the musicians the lead character would be enamored with. Disco High would have been dated very quickly, but I'd gladly check out a movie about any of those performers mentioned above. Still, I don't think any of them (except maybe Van Halen) would have made the film turn out to be quite the enduring, beloved cult classic that it is. 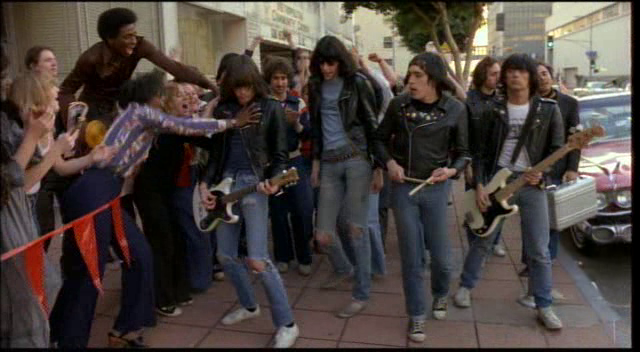 When the filmmakers landed on getting the Ramones and their punk rock music for a movie called Rock 'n' Roll High School, they struck gold. The high school in question is Vince Lombardi High School, and the early minutes of the film paint this as being one dull, dreary place. Then, a sign of life - student Riff Randell (P.J. Soles of Halloween) and her pal Kate Rambeau (Dey Young) cut into the school's P.A. system to blast out a song by the Ramones, a band which Riff is an obsessive fan of. She has even written a song she hopes to get to the group, a song called "Rock 'n' Roll High School". 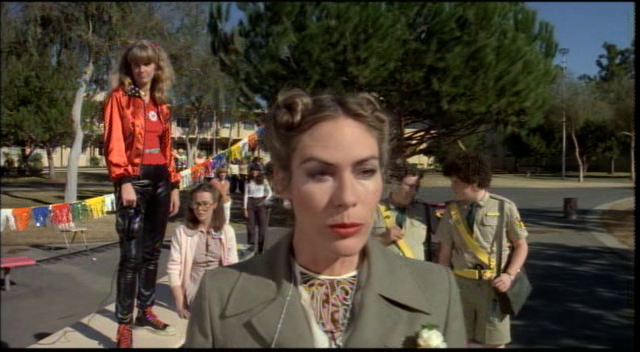 Riff's fellow students seem very appreciative when she starts playing Ramones music at school, but someone who does not approve is the school's newly appointed principal, Mary Woronov as Evelyn Togar. Togar is a cold, harsh woman who has promised to rule the school with an iron fist. She and Riff are instantly at odds, especially since Togar is strictly anti-rock 'n' roll - and she has scientific studies to back up her bias. Studies have shown that mice that are subjected to rock music become fans of the music and grow to human size. But if they listen to too much loud rock, these human-sized mice are also prone to exploding. Thankfully, that mouse silliness is only something occurring on the periphery of the story, it's not actually important to the plot - we just happen to see a human-sized mouse enjoying a Ramones concert at one point. The main focus is Riff's endeavor to get to that Ramones concert and her conflict with Togar over her musical taste as Togar goes on a record-burning quest to eradicate rock 'n' roll. There's also a subplot involving the burgeoning romance between Kate and classmate Tom Roberts (Vincent Van Patten), a relationship spurred along by Clint Howard as Eaglebauer, the teenage entrepreneur everyone at Vince Lombardi goes to if they need help. Fake IDs? Test answers? Love advice? Eaglebauer has you covered. 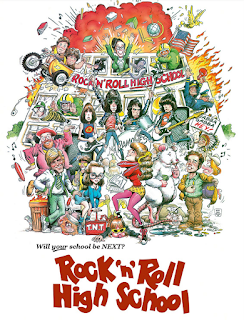 Rock 'n' Roll High School is a really fun, goofy little movie that you'll obviously enjoy more if you enjoy the music of the Ramones, since the soundtrack is packed with Ramones tunes. Those songs push forward an entertaining story about standing up to oppression so you can live and rock however you want. Who can't get behind a story like that? The River Wild is a movie I apparently had to grow into. 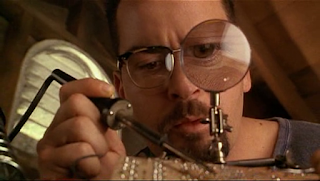 It was a box office success at the time of its release in 1994 and got a good amount of attention, which makes sense when you consider the cast that director Curtis Hanson assembled for what could have easily been just another thriller. Despite all this, I didn't like it very much when I first saw it on VHS when I was 11 years old. I couldn't connect with the characters and the pace didn't work for me, there wasn't much there for me to grasp on to. However, revisiting it more than twenty years later, I find that The River Wild works much better for me as an adult - now I can appreciate it as a well-told, effective, interesting thriller. The film centers on three members of the Hartman family: Gail (Meryl Streep), an outdoorsy type who grew up rafting the whitewater rivers of Idaho; her city slicker husband Tom (David Straithairn), who has been neglecting his family in favor of his work as an architect in recent years; and their son Roarke (Joseph Mazzello), who resents his father for not being around enough. To celebrate Roarke's birthday, the trio leave their home in Boston for a rafting trip in Gail's old Idaho stomping grounds, bringing the family dog along with them. Tom is entirely out of his element on the river, but he has come along in hopes of reconnecting with his son and saving his marriage from the edge of divorce. This endeavor is threatened when the family finds themselves having to help out two men who have been abandoned on the river - or so they say - by a more experienced friend. These men are John C. Reilly as the dim, skittish Terry and Kevin Bacon as the extremely charismatic Wade. Roarke is instantly won over by these guys, who are more interesting to him than his stuck up father is, and Gail is very charmed by Wade. Only Tom is suspicious of them, mainly because Wade and Gail seem to be getting way too close for his liking. By the time Gail realizes there's something off about these guys, it's too late. The family is taken hostage by the pair, who are revealed to be thieves on the run from the law. As Wade sees it, he needs Gail alive to get them down the river and needs Roarke alive so he can keep Gail under control, but Tom and the dog are expendable. His attempts to remove the expendable members from the situation causes them to be separated from the group while Gail and Roarke are forced to accompany Wade and Terry down a stretch of river so treacherous that people aren't allowed to ride down there anymore. This stretch of river is called the Gauntlet, and Gail has run down it before - many years earlier. While Tom (with the dog by his side) desperately scrambles to save his family, the film reaches its climax through an 8 minute sequence in which the raft carrying Gail, her son, and the two criminals runs down the white waters of the Gauntlet. It's an impressive, exciting sequence that was probably even more impressive and exciting back at the time of release, when such a sequence could really be a drawing point for a film. I feel like audiences nowadays are probably used to things being bigger and more outlandish than this, which is a bit of a shame. Scripted by Denis O'Neill (with uncredited revisions by Carrie Fisher), The River Wild is quite engaging to me now. The story is interesting, the character interactions are captivating, and I was intrigued to see how things would play out, since I didn't remember from my viewing twenty-plus years ago. This is probably a "been there, saw that" film for a lot of viewers by now, but for me it was nice to re-discover it and I enjoyed giving it another chance at a different stage of my life. 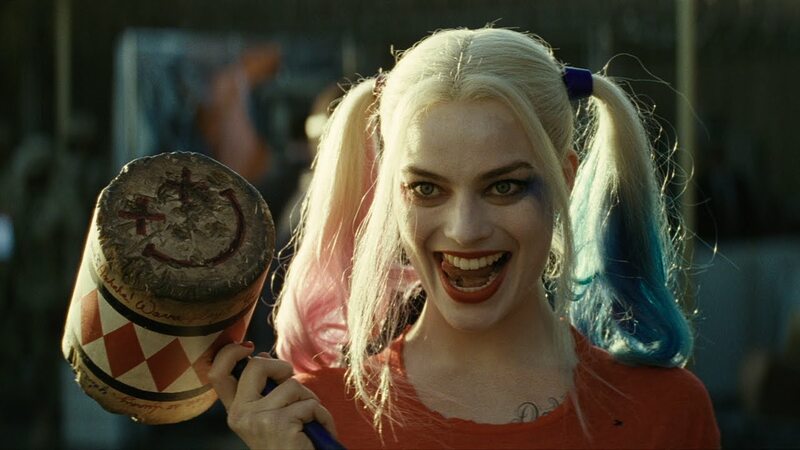 Suicide Squad is an entry in the DC Comics film universe that Warner Bros. is putting together, the third film in the series that started with Man of Steel and continued with Batman v. Superman: Dawn of Justice. It's a "men (and women) on a mission" film in the tradition of films like The Dirty Dozen, the 1967 classic about a group of convicts who are assembled to go on a suicide mission during World War II. Here, the arrival of Superman is behind the decision made by government official Amanda Waller (Viola Davis) to assemble a team of villains that readers of DC Comics may be familiar with (some more than others) - Superman is a good guy, but what if someone will similar powers should show up who isn't such a good guy? Individuals with super powers would be needed to stand up to this super powered villain, and Superman was killed at the end of Dawn of Justice. Someone is going to have to take his place. Enter Task Force X. If Waller needs people with super powers, I'm not sure why some of these characters are chosen for this "suicide squad". Some of them make sense - El Diablo (Jay Hernandez) controls fire and has a demon lurking within him, Killer Croc (Adewale Akinnuoye-Agbaje) is an extremely strong beast-man, June Moone the Enchantress (Cara Delevingne) is possessed by the spirit of a powerful sorceress... I can even let the presence of Floyd "Deadshot" Lawton (Will Smith) slide, because the guy is a hell of a marksman. But Slipknot (Adam Beach), a guy who "can climb anything"? I suppose he could be more useful than Captain Boomerang (Jai Courtney), who's just a thief who throws boomerangs. 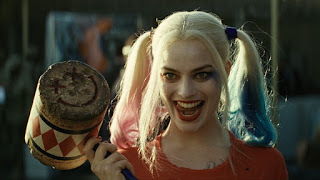 And then there's the most popular member of this team, Harleen Quinzel / Harley Quinn (Margot Robbie), who is pretty much just there to be fun to watch, because you wouldn't expect a crazy person to be much use against a Superman type. She doesn't have any powers. Waller has assembled this team just in time, because super powered villainy breaks out on a massive scale immediately after she puts this plan in motion. And the culprit is one of the chosen team members - the Enchantress breaks loose and uses her powers to take over a place called Midway City, filling its streets with monsters and trapping Waller with the city. Task Force X is dispatched to save Waller and thwart the Enchantress's mystical plans. Leading the mission is Army Special Forces Colonel Rick Flag (Joel Kinnaman), who happens to be June Moone's boyfriend, and Tatsu Yamashiro / Katana (Karen Fukuhara), who wields a sword that traps the souls of her victims within its blade. The speed at which Warner Bros. is building up to their superhero team-up film Justice League seems a bit fast, and the fact that they've already made a villain team-up film packed with villains who haven't been in any movies before seems even a little crazier - but not so crazy when you take into account that this project was first announced in 2009, before it even had any other DC movies to connect with at all. Some of these characters don't really need to have been introduced previously, while those who could have had prominent roles in movies building up to this one are given back stories that show they have history with DC heroes that we weren't shown. In fact, the most fun part of the movie is when we're being caught up on the history of these characters, a sequence that takes up most of the first 20 minutes. 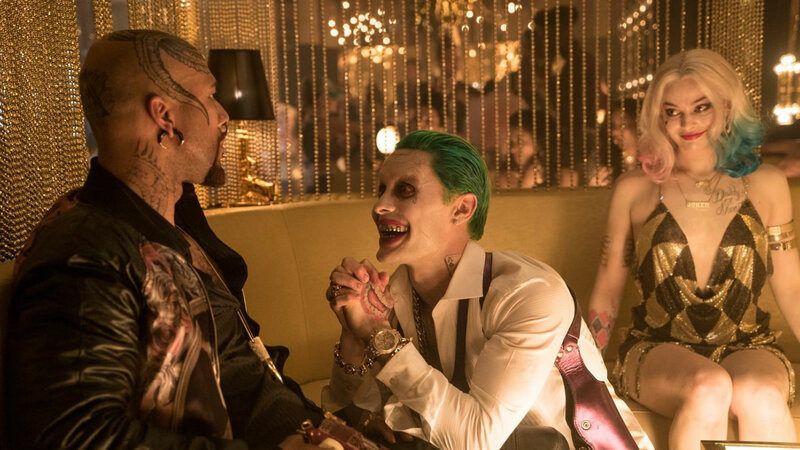 Deadshot and Harley Quinn could have been villains in Batman movies - Harley likely alongside her boyfriend The Joker (Jared Leto) - and Batman (Ben Affleck) does indeed cameo in their back stories. Captain Boomerang doesn't seem like much, but he gets the honor being apprehended by The Flash (Ezra Miller) in his back story. 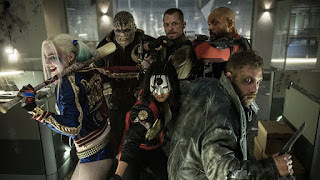 Once the characters have been introduced, Suicide Squad starts to feel like it's going off the rails a bit, with some story elements being rushed through and things playing out in a disjointed manner. The Enchantress's turn is very sloppy. When the team reaches Midway City, the film lets them down a bit. This is an interesting group made up of some cool characters being brought to life by a solid bunch of actors, but there's nothing interesting about the threats they're facing. They mow down monsters in action sequences that I didn't connect with at all. The movie sort of lost me right when I should have been getting excited to see its anti-heroes in action. 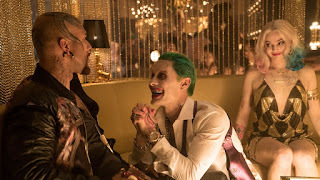 The unusual look of The Joker in this film got a lot of attention, and while I'm not a fan of the tattoos or the metal grill (which apparently has an explanation involving Batman beating the hell out of The Joker in their past and knocking out his teeth, an explanation we're not actually told in the film), Leto does a serviceable job of re-introducing The Joker to the screen. He's following in the footsteps of actors who gave iconic performances, and while he doesn't give an iconic performance himself, and doesn't really have enough screen time to allow him to do so, he gets the character back on the screen and will be accepted when he returns to the role in another film. Suicide Squad is sort of a middle-of-the-road film that mostly coasts on the coolness of its characters and actors. I don't have any strong feelings about it in any direction. It was there for a couple hours, I was a little letdown, I was mildly entertained. David Twohy got his start writing about the alien monsters of Critters 2 and has gone on to spearhead the alien-filled Riddick franchise that started with Pitch Black, and in between those two he wrote and directed this "first contact" alien movie, which went into production with the title Shockwaves - and during a television interview, star Charlie Sheen said one of the main reasons why he decided to do the movie in the first place was because he thought Shockwaves was such a cool title. In The Arrival, Sheen plays radio astronomer Zane Zaminsky, whose job is to scan the skies for the SETI Institute. When Zane picks up on radio transmission from somewhere in outer space, a transmission that seems to be some kind of distress call, this breakthrough in the search for extraterrestrial life gets him fired and accused of faking signals. His boss Phil Gordian (Ron Silver) destroys any trace that the transmission ever happened. Using his technological know-how, Zane continues the search for answers in his spare time and discovers that a massive cover-up is being carried out. A cover-up that is leaving death and destruction in its wake as someone tries to bury information on alien life and climate change. Soon people are trying to kill Zane as well, and given the way that their appearance alters and they can bend their knees backwards to launch themselves to a great height - it is very amusingly goofy the first time we see this happen - it's apparent that they aren't actually people at all. You might think the casting of Sheen as a brainy tech whiz would come off as ridiculous, but he actually does quite well in the role, he's convincing as this character and allows us to get on Zane's side even though he's not the greatest guy, particularly in some of his interactions with his girlfriend Char (Teri Polo). Watching The Arrival now, I didn't see anything within it that would seem to make it all that memorable - it's a fine movie, driven by an interesting story and a well-told conspiracy mystery, but there's nothing mind-blowing in here. And yet, for some reason this movie has been stuck in my mind in some way for twenty years. Maybe it just came along at the right time to make an impression on me, but I've never forgotten those backward kneed aliens, or Sheen on that talk show mourning the title change. This has always struck me as one of the highlights of his career, and after rewatching it I would still say that it is, although there are some absurd things in here. 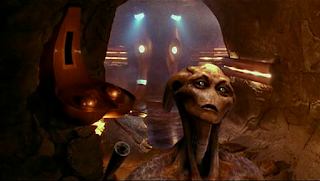 Not even the CG aliens are as dopey as that moment when Zane steps into one of the aliens' appearance-altering machines in Mexico and gets a hi-tech makeover to look like a local man, complete with darkened skin and a stereotypical mustache. Yikes. That scene is definitely not a highlight.